There has been some remarkably bad media coverage recently - All you have to do is think back to the day just over a week ago when the rumors flew that Favre was retiring. We were told that he had told teammates via text message, and that he had talked to the team. There was only one problem - it wasn’t true. That didn’t stop the media, though - everyone wrote articles about what his retirement meant, and ESPN showed an endless reel of highlights and insights. It was shoddy journalism at it’s best - reporting on an incident before confirming it had actually happened. In and of itself the coverage was just annoying, but there is a lesson to be taken from all of it - ignore everything that has been written or will be written about this. Basing any betting decisions on ‘news’ or media insights is a total waste of time. Until he cries at his next retirement press conference you can assume he’s still playing. Really, you can probably assume the same even after that press conference. Everyone says that they don’t care anymore, but of course they still do - Favre fatigue is a total myth. It just doesn’t exist. Everyone says that they don’t care anymore, and that they are totally done with the situation, yet his every move makes headlines and gets discussed to death. I’m as bad as anyone - I say I hate talking about the guy, but I keep writing about him. Favre is important because everyone thinks he’s important. 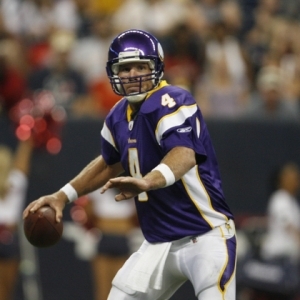 As a bettor you can’t ignore what everyone is talking about, so you are stuck with Favre whether you like it or now. The team doesn’t seem bothered either way - The striking thing every time I see an interview with a Vikings player is that they just don’t seem bothered by the situation. They seem to know that he probably will come back but he may not, and that they are going to be fine either way. I get the distinct impression that they like what the guy can do on the field, but they don’t ultimately care one way or the other if he comes back. That’s obviously an oversimplification, but you get the point. Assuming that the team is going to live or die by this decision, or that they are perched on an emotional ledge that they could be pushed off of if Favre retires just isn’t right. They are just going about their business - just like they did last year when this exact same thing happened. The backups aren’t hopeless - This is the biggest thing to keep in mind, and the one point that gets missed in a lot of discussions - they aren’t in terrible shape if Favre retires. Both Tarvaris Jackson and Sage Rosenfels have started in the league. Both of them have been with the team for a while, and both know the offense very well. Both of them can throw the ball well. No matter what, the quarterback is going to have lots of offensive tools around him, and a very good offensive line to hide behind. The fact is that the expectations between a 40-year-old Favre with a bum ankle and the better of the two alternatives aren’t nearly as different as they are perceived to be. This isn’t Armageddon, but it will be perceived to be. That could create an opportunity. Futures Odds are in total chaos - The most interesting thing to watch about this drama has been the way the books have been forced to react. They started by setting numbers basically assuming he would be back, but they couldn’t be too bold in case he wasn’t. When he supposedly retired they adjusted their numbers. When that story was debunked some books adjusted the numbers again, while others just pulled them off the market until there was clarity. All in all, the number are just a mess. Unless you really like to gamble it probably makes the most sense to just be patient and wait for things to sort themselves out. Besides, there is no doubt now that this is a public team so there probably isn’t a whole lot of value in the futures anyway - especially if you like the team.